PEPperCHIP® is the most economic platform for antigen and epitope discovery in a single step. The large number of different peptides on PEPperCHIP® Discovery Microarrays allows screening of more than 300 antigens translated into overlapping peptides. Smaller antigen libraries can be analyzed on PEPperCHIP® Custom Microarrays with standard dimension. 334 different proteins of interest were translated into 15 aa peptides with a peptide-peptide overlap of 10 aa resulting in 26,463 different peptides in duplicates. The first assay was based on pooled control sera at a dilution of 1:1000 followed by data read-out and quantification (left on top). A second assay was done with pooled patient sera at the same dilution (right on top), and clearly revealed a number of antigens and epitopes that were exclusively stained by the pooled patient sera. 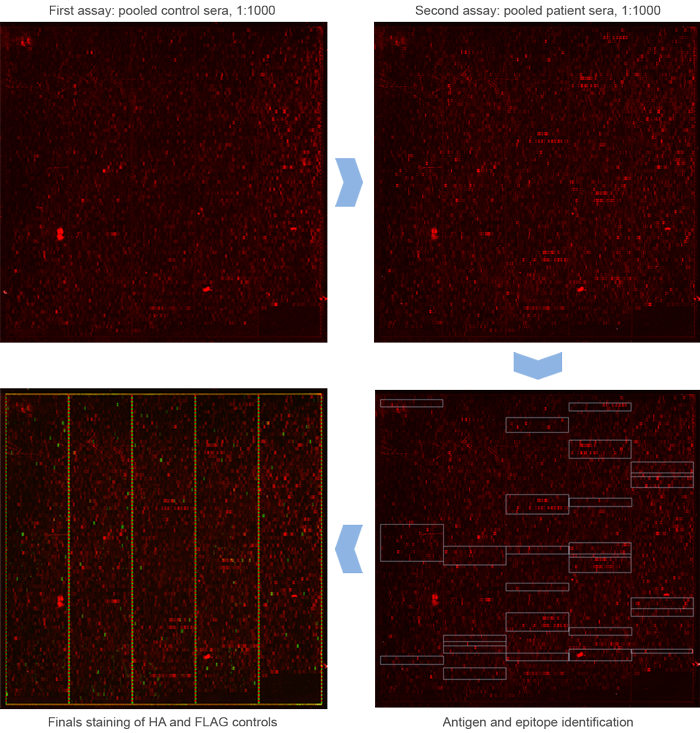 Antigens and epitopes with the highest differential response were selected (right on bottom) for further investigations with increased serum numbers on PEPperCHIP® Peptide Microarrays with standard dimensions. Staining of HA (red) and FLAG (green) control peptides complement a typical Antigen and Epitope Discovery Screen (left on bottom). PEPperCHIP® analysis is straightforward and can be performed in your own lab or covered by our PEPperMAP® Service. Further information about lab requirements for chip analysis can be found here. Due to the large array format and the associated high amount of data, PEPperCHIP® Discovery Microarrays are exclusively provided in combination with a PEPperMAP® Service.